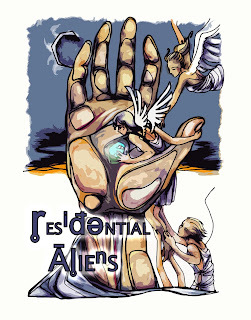 + Sci-Fi Flash Humor (500 words): Ever wonder why we have so many kooks living in the desert of New Mexico? Here's one answer. "We are your progenitors, your fathers and mothers. You, the people of Roswell, are our offspring. We've been mixing our DNA with the gene pool of this town for a long time. And now, we've come to take you all home!" + A Sci-Fi Thriller (3250 words): Shawn Holt, aka the Alabama Hammer, is on his way to the top of the pro wrestling ladder. But is it a case of "the higher you climb the further you fall?" "By the time he entered the arena’s underground parking garage, all of the other wrestlers had departed. He strode toward his Corvette, his heavy footsteps echoing through the emptiness. As always, Shawn picked up his pace. Something about being alone in such an empty place always made him uneasy, a secret he guarded with his life. Even though he was little more than an actor playing a character on television, he still had an image to uphold." + A Speculative Thriller (2310 words): Young Will awoke to find himself surrounded by toys and children. It was an adventure at first - then the Toy Soldiers came to life. Was it all a dream...or the beginning of a nightmare? "The important thing to realize is that you cannot die here," John said to Will. "No matter how much they hurt you, pain is all that they can cause. Do not let them lure you towards the Exits—"
+ Supernatural Thriller (3710 words): Anna has a date with destiny. No, really, she does. And she'll drive just about anywhere to catch up with him. The first time it happened, I told Jim I'd just taken my eyes off the road for a moment. I blamed it on the migraine, the sudden pain, the dizziness. I didn't mention the man at all. + Science Fiction 'First Contact' Story (2290 words): Tom, 65, retired, amateur prospector, thought the object he'd just uncovered was a radio. But he talked to it anyway. "What do you mean a probe? Are you stranded somewhere in the desert?" + Science Fiction Mystery (4930 words): "The body of an eleven year old human girl was found two blocks from your bar, stabbed to death." Lieutenant Junior Grade Palladia Conté felt a cold wave of nausea well up in the pit of her stomach. Who would bring a child to a place like this? + SciFi Flash Humor (1030 words): Tasca the Hunter moved on all fours, in the way of the People. His lean, smoke-gray body blended well with the predawn grayness. Today Tasca hunted not for food, but for something far more important—knowledge. Tasca repeated the sounds he had made the other day, simple speech of the People, the sounds of a child. He knew the being before him was intelligent, perhaps omnipotent, yet speech seemed to elude it. PunSpec Contest Winners + 5 Punny Stories to Make You Groan! 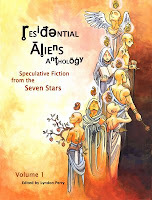 + Residential Aliens Anthology, Volume 1 is now available at Lyn's Storefront.